OSIP Award - The OSIP Foundation, Inc. 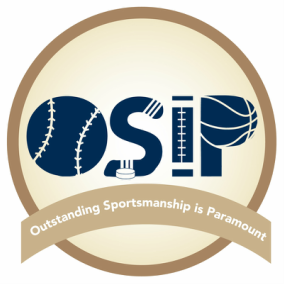 The OSIP Foundation, Inc., has established the “OSIP Award” as a way to recognize members of the athletic community who exemplify the morals and values of good sportsmanship and/or fanship through their actions and character as a person in competitive environments. The award is currently awarded to 8th grade athletes at Timberlane Middle School in Pennington, NJ. If your school is interested in presenting the OSIP Award, please contact us. -Nominees should represent the morals and values of good sportsmanship and/or fanship, specifically through actions as part of your scholastic team this season. -Nominees should be friendly, courteous, respectful, encouraging, and generally positive. -Nominees should be known to show respect not just to teammates, but to opponents and officials (perhaps more so to opponents and officials). -Nominees should demonstrate a maturity in understanding bigger concepts in life beyond winning and losing; in other words, they can be competitive without being disrespectful. -Nominees should demonstrate grace in both winning and losing and not partake in any action which may inappropriately draw attention to them or demean opponents or officials. -Nominees should never use “trash talk” or bait or berate an opponent. Nominees should realize that all opponents, officials, spectators, and persons present are also human beings and should be treated as they would wish to be treated. -Nominees should be “quiet leaders,” regardless of whether they are a team leader or captain. That is, they lead by example and do not require the recognition of others for their good deeds to continue to perform them. -Nominees should be gracious hosts at home games and respectful guests at away games. -If nominees were disciplined for poor sportsmanship this season (or who has been at fault for partaking in any of the behaviors listed above for which they should not have done so), either through ejection or penalty levied by an official or a coach’s sanction, please explain why the nominee has improved and deserving of this award. The ability to recognize a mistake and make amends for it falls well within the understanding of good sportsmanship. Please visit www.nfhs.com (National Federation of State High School Associations) or www.njsiaa.org (New Jersey State Interscholastic Athletic Association) to reference definitions or codes of conduct.